This is the first poem I read by Jim Andrews and it is still a favorite because of its elegance, economy, and naughtiness. It is also Andrews’ first DHTML poem, written in the early days of the Web (1997), and marking a shift in his practice from visual poetry to a poetry in which he yields some of his control over the text to his readers. 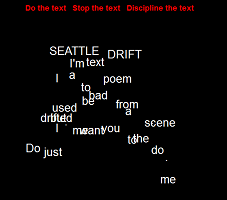 This poem, along with “Enigma n” and the “Stir Fry Texts” punctuate a vibrant period in his development as a Web artist in which he started to imbue his texts with behavior: responsiveness to carefully defined user input, motion triggered and controlled by interactivity, controlled randomness, and looped or open ended scheduling of the experience. For a close reading informed by media-specific analysis of “Seattle Drift” read the sub-section titled “Drifting from the Scene” in my dissertation (172-184). You can also read about this period in his artistic development in the section titled “DHTML Dances” (158-206).